My rhubarb plants start testing the air in mid-winter, sending up ruffled probes through the mulch to ask, “Is it time yet?” Those persistent little sprouts are always a cheerful reminder that Spring will eventually come, no matter how remote it seems on a cold, gloomy day. The strawberries are not yet planted, but the rhubarb was ready to harvest before the daffodils budded. I topped my Yogurt Biscuits with roasted rhubarb in a vanilla-scented syrup and whipped cream to make shortcakes, the perfect dessert to welcome the season! Preheat oven to 350 degrees F. Place rhubarb, both sugar substitutes, and wine in a medium baking dish and stir until mixed. Scrape seeds from vanilla bean over rhubarb, add the vanilla pod, and stir to combine. Roast until rhubarb is tender and juices are syrupy, about 30 to 40 minutes, depending on the size of the stalks. Discard vanilla pod. Beat cream and 2 tbsp sweetener (any sugar sub will do) in a medium bowl until soft peaks form. Split warm biscuits and brush cut sides with melted butter. 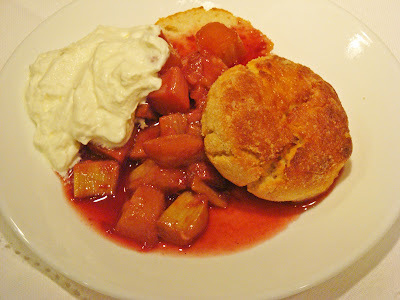 Spoon roasted rhubarb and juice over biscuits and serve with whipped cream. *Note: I revised the recipe and the nutrition data after publication. I made a mistake in measuring the rhubarb and forget to add the counts for the butter. Sorry! * Count assumes zero-carb sweeteners. This looks really good, never thought about a rhubarb being sweetened enough to eat like a desert. Will have to try.Thanks. Lisa:It can be used like a very low-carb fruit. You are in for a treat if you haven't tried it for pies and desserts! Thanks for the comment.